If you have gas appliances, congratulations! Appliances powered by natural gas are generally considered to be much more energy efficient than their electric counterparts so your energy bill likely thanks you for your purchase. Unfortunately, with gas-powered appliances comes the possibility of a gas leak which can cause dangerous amounts of carbon dioxide to be released into your home’s air. Learn how to detect a gas leak and what you should do to fix it in today’s blog. 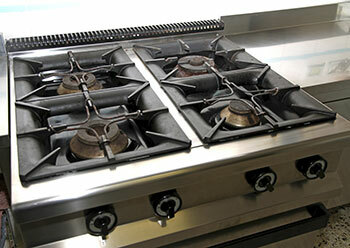 Gas appliances offer many benefits but a gas leak can be catastrophic. The first step when you want to detect a gas leak is to ensure the area is properly ventilated. Also, be sure that there are no open flames nearby or the possibility of a spark as this could cause a catastrophic fire. Turn off the gas, open all of your windows, and then you’re ready for step 2. You’ll be using a soap solution to detect your leak, so combine a few tablespoons of dishwashing soap into a bucket of water. Using a sponge, wipe down the area along the gas line where you think the leak might be. Try not to get it too wet but there should be a thin layer of soap along the line. Turn the gas supply back on and keep an eye on the soapy area of the gas line. If you see any bubbles begin to form, this indicates that there is a leak in your line. If you don’t notice any bubbles then you likely do not have a gas leak on your hands. How do I fix a gas leak? Gas line problems require an expert to repair. There are many things that can go wrong during repair and by attempting to fix it yourself, you could run the risk of creating an explosion. An experienced plumber will be able to quickly and effectively get the job done without risking the safety of your home and family. Got a gas leak? Give Master Plumbing & Mechanical a call at 301-650-9100 and let our experienced plumbers get the job done right. This entry was posted on Friday, January 8th, 2016 at 4:04 pm. Both comments and pings are currently closed.